Every year, more than 3.6 million referrals are made to child protection agencies involving more than 6.6 million children. The month of April is National Child Abuse Prevention month. The Pike Regional Child Advocacy Center is raising awareness about the impact child abuse has in the area. 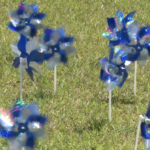 The awareness includes pinwheels that popping up around Troy. Each one represents a symbol for a child abuse victim. “We put those out every April to recognize children as having a happy, hopeful, well-rounded future,” Executive Director of the Pike Regional CAC Camille Downing says. She says they see sexual and physical abuse cases and neglect regularly and she encourages anyone who witnesses such cases to come forward. Downing says the reasoning is simple. She says children do not always have a voice and they need an advocate on their side. The Pike Regional CAC also points out that there is a difference in abuse and discipline. Downing says she hopes someday, child abuse cases will be a thing of the past. For now, the advocacy center will do everything it can to raise awareness for child abuse. Reporting abuse cases can be done completely anonymously..
For now, the pinwheels will keep spinning to raise awareness for child abuse victims.. The PRCAC manages Pike, Coffee, Barber, and bullock counties. To report child abuse and neglect, you can reach them at 670-0487.